Idaho Joint and Spine & Dr. James Whitaker are proud to be serving those who suffer from headaches and migraines in Boise, Kuna, Meridian, Nampa and the surrounding areas from the Treasure Valley to the Magic Valley. There are 36 million Americans who suffer from migraines and even more with other forms of headaches. With over 20 types of Primary Headaches and even more Secondary Headaches, it is important to have a physician who understands Headache Medicine. 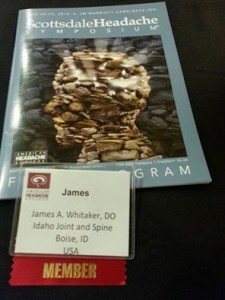 Dr. James Whitaker is one of those physicians and is proud to serve the Boise, Idaho area. Click HERE to learn more about the possible treatments Dr Whitaker employs in creating your individualized treatment plan. Dr. Whitaker is a member of the American Headache Society and he attends their conferences regularly. He personally suffers from episodic migraine headaches and has family members who have suffered from debilitating migraines. This fueled his interest in headache medicine. As a resident in Physical Medicine and Rehabilitation he opted to have additional training with board certified, industry leaders in headache medicine both at the University of Missouri and at Mercy Hospital in St. Louis, Missouri. As an osteopathic physician, expert in osteopathic manipulation, and as a massage therapist, Dr. Whitaker excels with treating all types of headaches.